There is a place for women in business in Delaware. 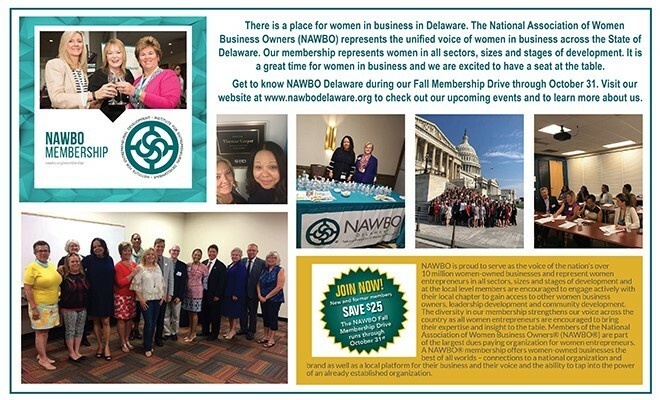 The National Association of Women Business Owners (NAWBO) represents the unified voice of women in business across the State of Delaware. Our membership represents women in all sectors, sizes and stages of development. It is a great time for women in business and we are excited to have a seat at the table. Get to know NAWBO Delaware during our Fall Membership Drive through October 31. Visit our website at www.nawbodelaware.org to check out our upcoming events and to learn more about us. Visit our website at www.nawbodelaware.org or visit us on Facebook.